India election: Largest vote ever Jump to media player Indians are set to vote in the world's biggest general election, with the ruling Congress party pitted against the Hindu nationalist BJP opposition. Paying for 'good' coverage in India Jump to media player India has seen a growing phenomenon called 'paid news', where money changes hands in return for sympathetic press coverage. 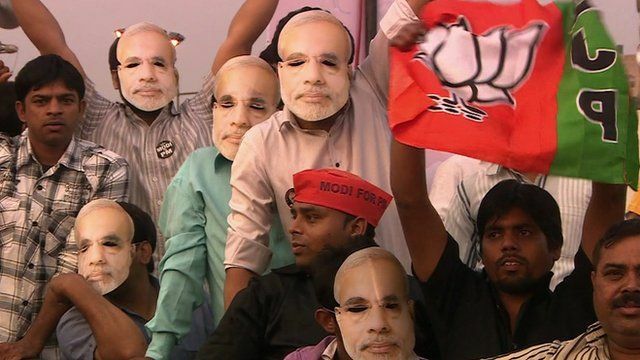 Inside controversial India election rally Jump to media player Rahul Tandon reports from an election rally for opposition leader Narendra Modi in Calcutta, which is just one of many Indian political rallies that will take place over the next few months. India election sparks printing frenzy Jump to media player With India's parliamentary elections about to begin, Andrew North visits a store which specialises in party political memorabilia. Indian professionals on campaign trail Jump to media player Young Indians are leaving professional jobs to campaign for political parties before India's election. Indians are set to vote in the world's biggest general election, with the ruling Congress party pitted against the Hindu nationalist BJP opposition. The nine-phase ballot begins on Monday and concludes on 12 May. Votes will be counted on 16 May. More than 800 million Indians are eligible to vote in a poll dominated by corruption and high inflation.